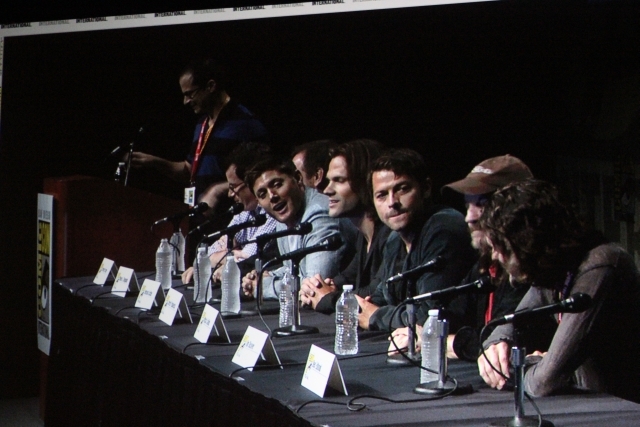 At this point it’s really not a surprise that the Supernatural panel at Comic-Con would barely release any information on the new season — though it’s a given that the writers and actors would entertain the hell out of the audience in Hall H.
Former writer Jeremy Carver described returning to Supernatural as the new co-showrunner was like leaving as a camper and returning as a camp counselor. And it’s hard not to be excited by the news, since he wrote standout episodes like A Very Supernatural Christmas and Changing Channels. On the other hand for Dean, Jensen Ackles reasoned that the only real romance in Dean’s life is the car, so in that route, yes, Dean has a love interest too. Misha Collins was asked about Castiel disappearing on Dean in the last season, but not wanting to give anything away, he panicked and looked to Carver for help. Their answer? Castiel went out for a beer and will be back shortly. Mark Sheppard being the modest man he is, told the audience that he’s waiting for the show to be renamed Oh, Crowley. And I must admit, I would support that idea. 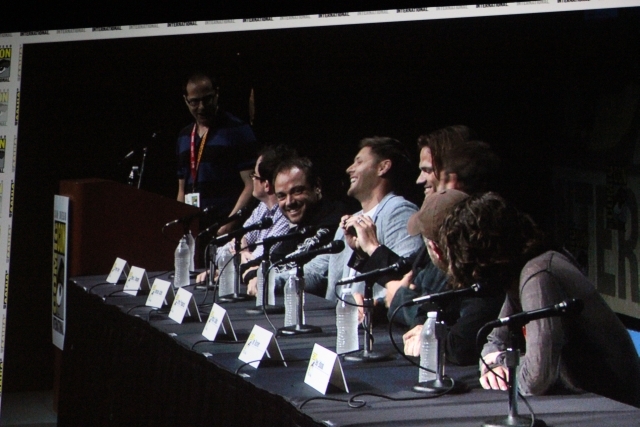 When asked about the premise for season eight, the writers and actors couldn’t help but interrupt each other. Incase you were wondering (of course you were) they did give a serious answer about the premise of season eight. The earlier seasons were more reactionary for the protagonists but for this one — for once — the brothers will be on the offensive right off the bat. They described the overall story arc having inspiration from Raiders of the Lost Ark, with opposing sides going after a particular power source. Oh, and purgatory? Instead of dedicating a portion of the season to Sam and Dean reuniting, purgatory will be a mystery that will be revealed through flashbacks during the season. Ackles took a moment to thank the fans for all their support, and mentioned, “Most shows go to Friday nights to die,” but due to all of us, Supernatural continues on and has moved to Wednesday nights at 9 PM. The new season for Supernatural premeires October 3.